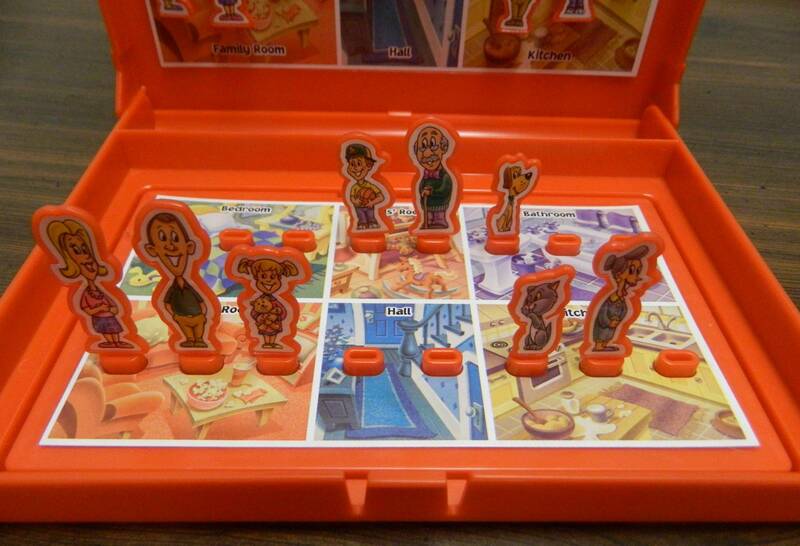 When I was a kid one of my favorite board games was Guess Who?. I have always liked deduction games and Guess Who? is a great simple deduction game for younger children. While I loved Guess Who? when I was younger, my opinion of the game started to shift when I got older. This mostly came from the fact that there is an optimal strategy to Guess Who? that kind of ruins the game. Once you know how to optimally play Guess Who?, there is no reason to ever go back to playing the game any other way. With how popular Guess Who? is, it is not surprising that there have been several spinoff/sequels produced over the years. Trying to find a game that fixes the problems with the original game, we have already looked at Electronic Guess Who, and Guess Who? Mix ‘n Mash. Both games improved upon the original in various ways. Today I am looking at another of the sequels, Guess Where?. Guess Where? takes what works in the original Guess Who? and mixes things up to add some additional strategy which creates a more compelling experience. How to Play Guess Where? Each player chooses a color and takes the board and pieces of that color. The players choose how many family members they are going to use. The more family members the players use, the more difficult the “mystery” will be. If the players choose not to use all of the family members, both players must use the same family members. Each player opens up their house. 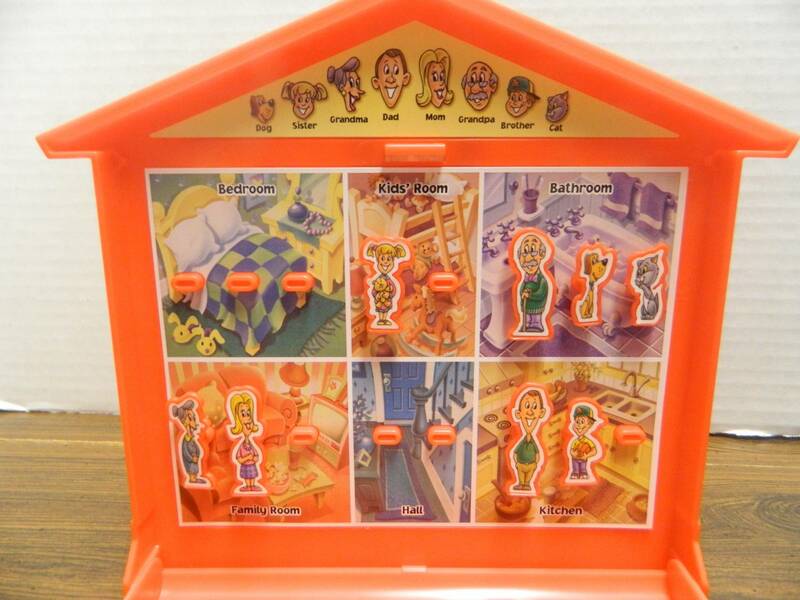 The players use their family members with the pegs on the back to hide their family members in the house. These family members will be placed on the board that is vertical. The players will then put the rest of their family members in the bottom section of the game board. The youngest player will then start the game. A player begins their turn by asking the other player a yes or no question about the location of the family members inside their house. Players can ask any question they want as long as it can be answered with yes or no. Some example questions include asking about rooms, family members, or the floors. Once a player has asked a question they will receive one of two answers. If the other player answers yes, the player can move their family members on the bottom section to reflect the information they received. Since they received a yes answer, they will also get to ask another question. If a player receives a no answer, the player’s turn ends. The other player will then take their turn. This player asked a question about where the pets were located. Based on the response they discovered that both pets are on the bottom floor of the house. After a player receives a yes answer they have an opportunity to make a final guess about the location of all of the family members. When a player chooses to make their final guess, they tell the other player their guess. If they are correct with all of the family members, they win the game. If they are wrong about one or more family members, the other player wins the game. This player has figured out where all of the other player’s family members are. This player has won the game. My Thoughts on Guess Where? If the title wasn’t already a give away, Guess Where? is basically the sequel to Guess Who?. Released 25 years after the original game, Guess Where? takes the series to the next level. Instead of just trying to figure out which character the other player chose, players are trying to figure out the location of characters inside a house. This means that players have to deal with up to eight different characters at the same time. The first player to figure out the location for all of the family members wins the game. While Guess Where? differs from the original game in a couple different ways, it still shares quite a bit in common with the original Guess Who?. The gameplay still revolves around asking yes or no questions in order to figure out details about the other player’s board. Instead of figuring out information about a person’s physically characteristics, you try to get information about their location. As the core gameplay is the same, your opinion on Guess Who? is likely going to be shared by Guess Where? If you like Guess Who?, I think you will really enjoy Guess Where? since it is a better game in my opinion. If you hate the original Guess Who?, Guess Where? is unlikely to change your opinion unless your issues with the original game is that it is too straightforward. While Guess Where? is far from a strategic game, it has quite a bit more strategy than the original game. The games may share the same gameplay but there is more strategy in Guess Where? due to two factors. First there is a lot more variety in the type of questions you can ask in the game. Instead of asking about facial features, you can ask about individual family members, groups of family members (age, gender, human vs non-human, etc), rooms, floors or even sides of the house. In the original Guess Who? there is a strategy you could literally follow every game and find the solution in six or less turns. You could ask the same questions in every game of Guess Where? but there is a lot more variety in the types of questions you can ask. Depending on the responses you get, you likely will have to adjust your strategy. I think a lot of the additional strategy comes from the quantity of information that you have to figure out. If you play with all eight family members, you will have to figure out eight main pieces of information. To get to those eight pieces of information you will acquire other information along the way. The “mystery” in Guess Where? is considerably more challenging than Guess Who?. You can figure out the other player’s character within six turns in the original Guess Who?. It will take you considerably more questions to figure out everything in Guess Where?. While there is a decent amount of luck to the game (more on this later), the key to doing well in Guess Where? is to ask smart questions. If you are lucky a specific question could immediately place a family member into their correct room. It is more likely to give you little information though. The better strategy is to ask broader questions which gives you information about several people/rooms at the same time. You can’t really ask questions that eliminate half of the options like the original Guess Who?, but clever questions can give you quite a bit of information. You can then narrow down that information into more specific people/room combinations. Another thing that I liked about Guess Where? is that the game is much easier to adjust to different skill levels. The original Guess Who? had no way to make the game easier or more difficult. For a child to compete with an adult they either had to get really lucky or the adult had to play sub-optimally. There is no need for this in Guess Where? as you can just adjust how many people each player has to find. If there is a younger child against an older kid/adult, the older player could just be forced to find more family members. This makes the game more difficult for one player which should make the game more balanced. Even if the two players are of an equal skill level, this makes it simple to make the game easier or more difficult. If you are playing with younger children you could find less people, while two adults can try to find all eight family members. There really is no way you could implement this type of mechanic in the original Guess Who?. Guess Where? is clearly superior to the original Guess Who? in my opinion. There are a couple areas where I think the original game is a little better though. It might sound strange but despite having more strategy, I think Guess Where? relies more on luck than Guess Who?. The reason that there is more luck in Guess Where? is that the game allows players to keep asking questions until they get a no response. I can somewhat understand this decision as it speeds up the game as you have to ask a lot more questions in Guess Where?. It adds quite a bit of luck to the game though because to do well in the game you have to get a lot of yes answers so you can ask more questions. The player that is able to ask more questions has a big advantage in the game. In some ways you can hedge your bets to increase your odds of getting a yes answer. If you ask really generic questions you have a much higher chance of getting a yes response. Where luck comes into play is how you end up phrasing a question. For example I might ask “Is the dog upstairs?” If the dog is upstairs I will get a yes and get to ask another question. If the dog is downstairs though I will get the same information but won’t get to ask another question. Instead of asking that question though I could have just as easily asked if the dog was downstairs. Which way I randomly chose to phrase the question determines how many questions I get to ask. If one player gets considerably more questions than the other player, they are going to have a very good chance of winning the game. Even if one player asks better questions, they can lose because the other player got to ask more questions. To make the game a little more fair I would consider eliminating this rule entirely. I think the players should just alternate asking questions. If you eliminate the rule entirely you will remove quite a bit of luck from the game. Instead of hoping to always get yes answers, getting a no response would be just as valuable. The other area where I think the original Guess Who? is better than Guess Where? is the theme. There is just something classic about the original Guess Who? where you asked different questions to figure out the other player’s identity. Growing up with the original game, it has a sense of nostalgia that I will never have for Guess Where?. In some ways I think younger children will prefer Guess Who? as the game is a little more straightforward. Objectively Guess Where? is the better game but I could still see some people preferring Guess Who?. Guess Where?’s components are pretty solid. First of all I appreciate that the game is portable. Both game boards can be closed which allows you to leave the box home while traveling. As Guess Where? is a game that will work well while traveling, this is a big plus. The component quality is solid. The components are just pieces of plastic with stickers but they serve the game well. I also thought the artwork was pretty good. The problem with the components is that they are kind of bland. They aren’t distracting but they are nothing special either. Should You Buy Guess Where? Guess Where? is an example of a board game that succeeds at improving upon the game that it is based on. Guess Where? 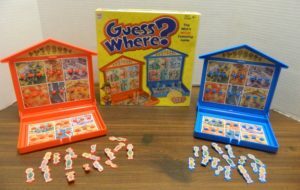 has basically the exact same gameplay as the original Guess Who?. Once again you are asking yes or no questions in order to get information out of the other player. Guess Where? feels like a step forward for Guess Who? though as the game has quite a bit more strategy since the “mystery” is considerably more challenging. Players have to figure out more information while also having more variety in what type of questions they can ask. This makes the game quite a bit more enjoyable for older children and adults. The game also allows you to quickly adjust the difficulty which makes it easier to play the game with players of different skill levels. Guess Where? does add some luck to the game though by allowing players to keep asking questions whenever they receive a yes answer. Guess Where?’s theme is also not as good as the original Guess Who? and it doesn’t have the same nostalgia factor. Guess Where? is objectively a better game than Guess Who?. If you were never a fan of Guess Who?’s mechanics, Guess Where? is unlikely to change your mind. If you wished Guess Who? was a little more challenging, I would consider giving Guess Where? a chance. I think fans of Guess Who? will really enjoy Guess Where? as it adds more challenge to the game while remaining loyal to the original game. If you can get a good deal on Guess Where? I would recommend picking it up. Have you tried the Shuffle Cards Guess Who? It’s basically the original game in card format, and all the same problems with the optimal strategy apply, but it’s compact and quite fun. I wonder if they can adapt this to a card version as well. 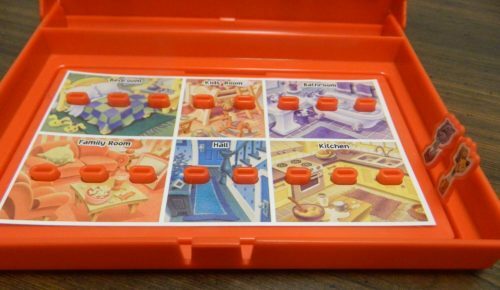 Given it looks like a cross between Guess Who and Battleship with a bit of Cluedo mixed in and they did it for all of those that could happen. I have not tried Guess Who? Shuffle. It sounds like an interesting twist on the classic Guess Who? though. As far as getting a Guess Where? version of the card game, I don’t think we are ever going to get an official version. Guess Where? was originally released in 2004/2005 but the game doesn’t appear to have been re-released. Therefore I am guessing the game didn’t sell that well. 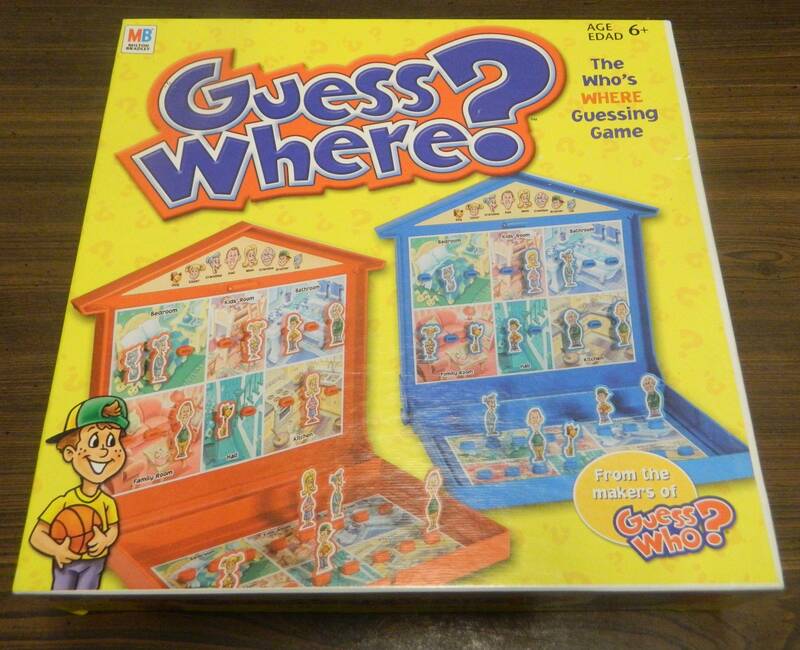 With the original game not selling that well, I don’t think they will ever release an official card game version of Guess Where?. I think a card game version of Guess Where? could be interesting though. Provides a more challenging "mystery" than the original game. Easily adjustable difficulty allows you to make the game easier or more difficult for players. Being able to keep asking questions with each yes answer adds quite a bit of luck to the game. The theme and nostalgia factor is not as strong as the original Guess Who?.